Spectacular transformation by Ms. Nisha Gurbani, going from fat to fit. I believe I am a woman of today’s generation, Independent, and Confident. But trust me this confidence and independence didn’t come to me overnight. I have gone through quite a few trials & tribulations. But I would say I’m a warrior and I’ve fought my way through. When I look back my past seems like a really bad dream which was my reality at some point of my life. I believe women are way stronger than they give themselves credit for. Have you heard the proverb “A diamond is a chunk of coal that did well under pressure”? Life tried to crush me but it only ended up creating a diamond out of me instead. Diamonds are extremely tough to break you know and so am I.
I used to be quite slim in my 20’s. I was a foodie and I still am (I think). Being a Sindhi, my food habits didn’t help me keep my weight under check. I slowly & steadily kept piling on kilos. Physical activity level reduced when work hours increased. I didn’t realize how much weight I had gained. I was in a kind of a denial mode. My energy levels began to suffer. I didn’t have the stamina I used to have before. I was getting tired too soon. I had aches and pains and I was feeling out of breathe. My self-esteem began to suffer eventually. I had to do something about this. I realized this was going to be a tough road especially for a foodie who literally lived to eat. Exercise was not one of the things I really looked forward to either. But one day I woke up & said “This is it. It’s now or never”. And like they say ‘the rest is history’. It was extremely tough for me. I had to keep reminding myself why I was doing this. I had to become fit, physically & mentally. There was no way I was going to live a life like this. There was a point where I really wished for an overnight transformation. Working out in the gym and controlling my diet was an uphill task. But every night I kept reminding myself “It’s now or never”. Initially I remember all days being bad but once I started seeing the transformation in the mirror, in my mood and my energy level I knew there was no going back. I actually started looking forward to my day to begin. In the beginning I tried dieting on my own from ketogenic diet to Low Carb Diet (LCD). And I did lose a lot of weight but these diets were not practical. I was feeling extremely hungry. After some point I would give up on this and start binging again especially at night I would get hunger pangs. I would revert back to my old eating habits at night. After some time my fat loss slowed down a lot in spite of being extremely regular with my work out. That’s when I sought a help of a professional dietitian who not only fixed my mid night hunger pangs but gave a more flexible diet plan. My diet was planned around my routine so that I didn’t have to make elaborate preparation. I actually enjoy drinking juices, soups, more of liquids. My diet was planned according to my preference without compromising on my nutritional status. I am a working woman who is out of the house from 9 am to 9 pm. My lifestyle coupled with food habits gave me a dozen of health issues, such as lower Back, Spasm, fatigue, stress and obesity, which were enough to lead to a dozen more. 11 Months ago my physiotherapist enlightened me about my condition in a nutshell when I had consulted him for a niggling backache. He said if I don’t notice the alarm this time, I would suffer like a 90 year old within the next 5 years. I heard that I kind of forgot about it. But I literally had an experience of what he said a few days later. After one hectic day, when I was lying down on my bed to get some sleep I got a sever cramp in my back. The spasm didn’t allow me to even move an inch. I can never forget those few minutes, where finally I had to ask my sister to help me get up. That fateful day it was very clear to me that I need to be serious about my health and within 15 days after my research for a Gym, suiting my time, goals & comfort I joined a gym. Yes. When I met my dietitian we discussed my health concerns keeping the fact in mind that my fat loss had also slowed down. So she advised to undergo quite a few blood tests to figure out what would be the underlying cause of all of this issue. My blood test said I was severely deficient of vitamin B12, folic acid & vitamin D3 which were apparently one of the causes of my inability to lose fat and the cause for my aches, pains and spams. My work out regime was extensive and my trainer was quite strict too, so we decided to add nutritional supplements to correct my levels and to avoid further nutritional deficiencies. How do you feel now about yourself? 3 Lessons I have learnt from fitness, I would wish to share. 1) Patience & Persistence, because it is not going to happen in day, it is not going to happen overnight, you need to work for it. 2) Dedication & Discipline, if you wish to achieve anything, hunger of how bad you wanted is going to change the game. Be it anything a purposed and disciplined lifestyle change will make you an achiever. 3) Attitude makes a person; It had, Is and always will be Mind over Body. A calm sea never produce the best sailor. Challenges are part of life, they make you tougher, stronger & better, now I feel I am the best version of myself each day. Trained by Mr. Aniket Chavan and then Mr. Sahil Hala. Dietitian – Dr. Pujah Kundaar. 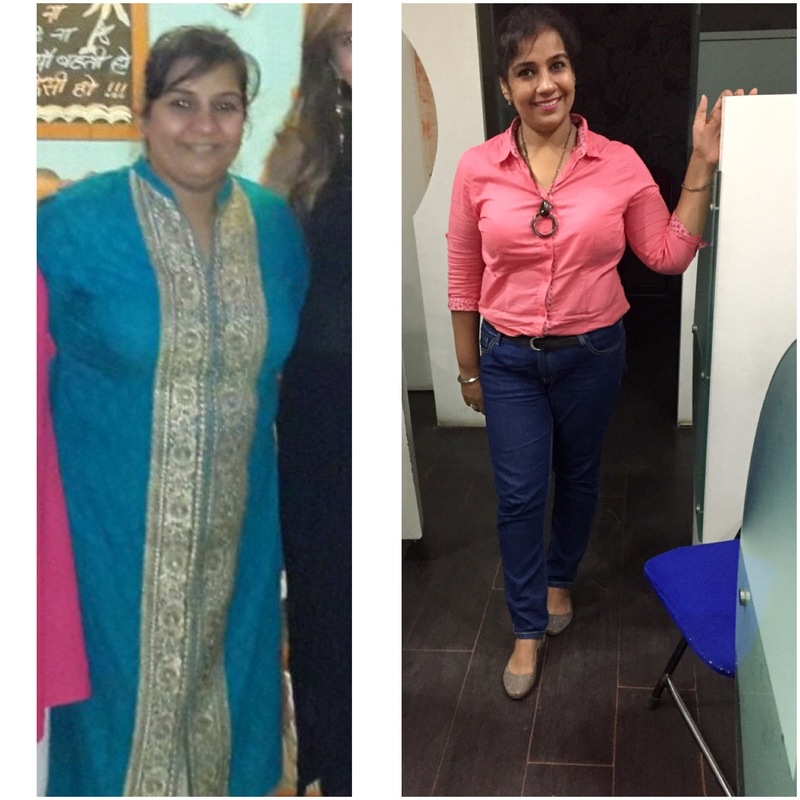 If Nisha’s story inspired you, click here to read more such spectacular weight loss stories! « The Choosy Chick Product Review: Grab Your Bundle Of Non-Toxic Products Today!